You don’t get to cherry pick Constitutional rights. You can find uninformed or stupid proponents of any view whatsoever, so the fact that the author encountered some dumb pro-choicers isn’t surprising or especially interesting. The scientific questions you and the author of the essay point to seem like uninteresting side issues. Or at least that’s what most thinking pro-choice people would say. The question of when “human life” begins is beside the point. A living human being can be worthless morally if that being is not a person with a sentient mind. Anencephalic babies are an excellent example. Killing a baby whose brain consists of just a brain stem is not wrong, despite the fact that the mindless baby is a human life. I’m open to the possibility that a fetus at some stage of development has enough of a mind that it should count as a person (although I’m also open to the possibility that even newborn infants don’t meet this standard–it’s an interesting and difficult question). But the idea that a four-celled proembryo is a person is about as credible as the idea that a bacterium is a person. Far more complicated beings like ants and jellyfish are obviously not people. From the essay: “Basing personhood on traits such as size, location, age, or level of dependency is fundamentally ablest and it is this mindset is that has led to the most egregious violations of human rights in history.” The author conveniently leaves out mental traits from the list. Basing personhood on very basic mental traits like the ability to think is not ableist. It’s simply a realistic appraisal of what personhood means. Life begins at conception, sure. But there are no non-religious reasons for thinking that personhood begins at conception. And murder is not the destruction of a life. It’s the destruction of a person. 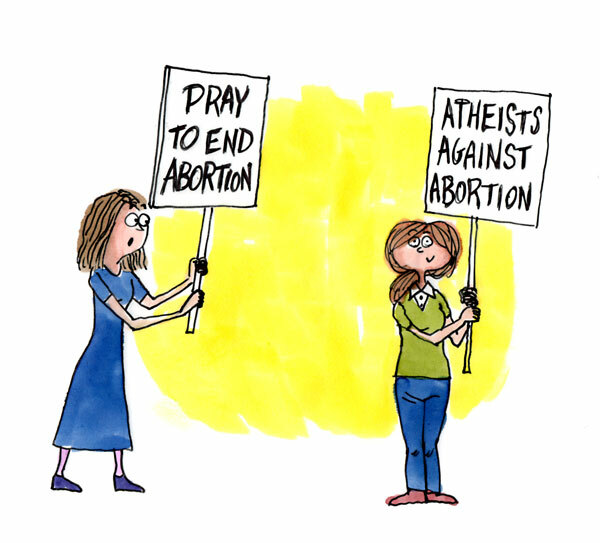 I’m sure it’s true that dropping the explicit appeals to religion would make atheists and agnostics feel more welcome, but rather more valuable, I should think, would be greater care in using words. “Person”, “human”, and “a human” are not synonymous in this context, nor are “fertilized egg”, “embryo”, and “fetus”, yet the author and her sources consistently rely on equivocating between them to make their arguments. I agree that the abortion conversation requires a discussion of what we mean by “person” versus “a human,” but there’s no point in having that conversation if the people we’re talking to won’t even acknowledge that the zygote/embryo/fetus is a human organism. I’ve wintessed countless conversations where this happens. I think usually people just don’t want to give any ground whatever in a highly polarized debate, but I’ve seen people act as if we can’t know what an “organism” is, or we can’t know whether our fetuses are the same species as us (Scroll to #3 – blog.secularprolife.org/2014/03/debating-abortion-with-other-secularists.html). This is not just “unthinking” pro-choicers. The previous link is about PZ Myers, who has been a developmental biologist for decades. Planned Parenthood employees are on record claiming there’s no heartbeat until months into the pregnancy and otherwise severely underplaying level of development. There’s a level of willful biological ignorance in this debate and it’s hard to have a philosophical discussion about personhood without first getting past that. Very interesting. And you’re right. At the end of the day this really hasn’t as much to do with religion as it has to do with embryology. Thanks for posting this, Ro.